Mini started life as a range of small cars, produced by the British Motor Corporation, until the marque was bought by BMW AG in 1994 and became a make in its own right. Very popular in the 60s, the Mini One is responsible for the iconic Mini style that you see incorporated into their cars today. Essentially the Mini is the British equivalent of the VW Beetle made specifically to provide the British market with a small, affordable car much like German buyers had available to them. Mini has become as much a symbol of Great Britain as the red phone box. All four Beatles owned Mini Coopers and you can even find Mini’s on postage stamps next to Queen Elizabeth’s silhouette. In 1961 the Morris Minor ( a product of Mini’s ancestors ) became the first British car to sell over 1,000,000 units and in 1999, the Mini Cooper was voted the second most influential car of the 20th century. Ever the mighty contender in the rallying world, the Mini Cooper S won the Monte Carlo Rally in 1964, 1965 and 1967, showcasing the capabilities Mini possessed to attain a fearsome rally reputation. As a Mini owner, make sure you protect yourself with a Mini car warranty from Warrantywise. We guarantee not to be beaten on price and cover for any Mini car warranty. The Mini Convertible is a trendy, sporty little car that strives to dazzle and impress as much as its hatchback siblings. Offering fantastic handling, performance and fuel economy, the Mini Convertible is perfect for showing off in a sensible British manner. 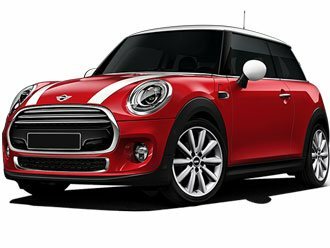 The Mini Cooper is currently one of the most popular Minis on the market and for good reason. Next to unbeatable all-round driving performance and multiple rally competition wins make this a highly desirable drivers car. The Mini Countryman is the SUV reincarnation of the beloved Mini Cooper. Typical mini handling, power and all round performance tie in nicely with the added practicality and driver view of a larger car. The perfect choice for a mini lover looking for a family option. The Mini Coupé is a unique yet gorgeous looking car. Handling and power are very good, the interior is posh and crisp with typical Mini styling cues and large central speedometer on the dashboard. The Mini Hatchback has been impressing UK motorists since 2001 and is proving itself to be timeless. The interior is unique, smart and quirky while boot space and general practicality is good too. As with most Minis, it drives like a go-kart. The Mini John Cooper Works is a performance driven hot hatch with attitude and archetypal Mini style. The John Cooper Works is blisteringly fast with fantastic handling and if your lucky enough to own one, you wont want to let it go. The iconic Mini One is the original that gave Mini its popularity. Good all round performance and its legendary status are a bonus but the real desirability comes from how much fun it is to drive.